I’m not sure what my expectations of Japan were. Whenever anyone asked where I was going on holiday and I told them Japan I was always met with, “Why are you going there?” The truth was because Japan was the one destination our flight points could get us to with Virgin Atlantic that neither Fraser nor I had been to before. People who had been before told us how amazing it was but most people were a little surprised with our choice, with many of Fraser’s friends thinking he must be going for business. Alongside this they are also really interested in foreigners. They want to know where you are from and the schoolchildren everywhere wanted to practice their English with us. The culture and history is so rich throughout the whole country. From the beautiful Buddhist temples and Shinto shrines to the horrors of World War 2 at the Atomic bomb park in Hiroshima. Staying in a Ryokan (traditional Japanese room) was a special way to feel closer to this and to really immerse yourself into everything Japanese. Despite all the culture the technology is so advanced. I have never been so confused by a toilet system in my life, why does anything need that many buttons and knobs? The big neon lights in all the city centres are so iconic and make for such an atmosphere. Nicely moving along from this is the public transport, particularly the bullet train. I have never been someone to get excited about a train, until now. It is so reliable (they apologised when one ran 3 minutes late), clean and comes with everything you could want including, to Fraser’s delight, lots of leg room. The fashion is crazy. The Japanese love anything kooky. I saw so many people sightseeing wearing Louboutins whilst at the same time donning an Elmo hat. I love it! The scenery is epic. Mount Fuji is one of the most iconic landmarks in the World and is no less impressive in real life, even if the weather didn’t always let us fully appreciate it. 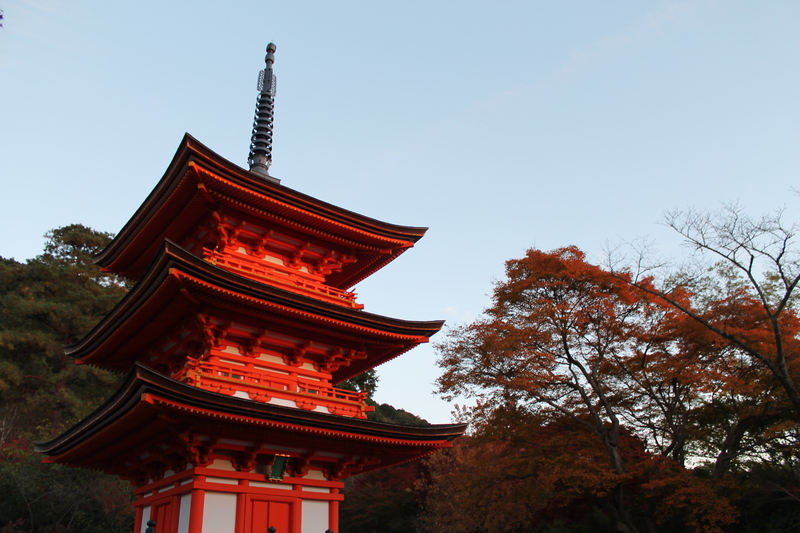 Autumn is a special time of year to visit to see the koyo, the colourful leaves. I know the cherry blossom is much celebrated but the crowds are also legendary and the autumn leaves are just as beautiful. It is not expensive as it is often thought to be. The flights, hotels and travel are pricey, but getting by day-to-day you can do on a budget. If you don’t want the fanciest food or most expensive souvenirs it is actually not that bad at all. Most tourist sites are either free or very reasonable and the failing strength of the Yen also helps it to be more purse friendly for tourists. It was not always on my bucket list of places to go, but now I have been Japan has truly stolen my heart and I would go back there to explore deeper and further off the beaten track. Going out to the less famous and less widely explored islands of the country. Tropical Okinawa and skiing up in Hokkaido are now firmly on my list. I can’t wait to go back! Thank you for your lovely comment. Not only was it my first trip to Japan but it was also my first time to Asia. We managed to go to Tokyo and Kyoto in a little detail but even though it was non-stop for 2 weeks i feel like we barely scratched the surface. I know i will be back one day. Japan is in my top three countries I’m desperate to head to, and Snow Monkeys has a lot to do with it! But everything else you said also resonates with my desire to go. I would love to climb Mount Fuji, and it’s great to read that a lot of the tourist attractions are free. The perceived price of everything is one of the big reasons why I haven’t gone yet. It doesn’t seem like a country that can be done on a budget… but with research I’m sure budget alternatives are available, as you mentioned! The monkeys are adorable. Once there you can do Japan on a budget. The cost of getting and staying there wasn’t cheap but everything there was reasonable, especially at the moment when the Yen is pretty weak. If you plan on making more than a couple of rail journeys pre-buying a Japan rail pass is well worth it as well. I hope you make it some time! Go, go, go! It’s awesome. Plus with the weak Yen it’s good value for money currently.